PlasmaDerm® activates the self-healing powers of the body and germ reducing reliably. The PlasmaDerm® product family is suitable for mobile treatment and care, since the devices are small, light and simple operate. The cold plasma generated by the PlasmaDerm® devices acts through the combination of a therapeutically relevant electrical field, low irradiation in the beneficial UV-A and UV-B wave length range, and activated gas particles (molecules) from ambient air. PlasmaDerm® is the first medical device to synergistically combine a number of well-characterised, therapeutically active components in one piece of equipment. The electrical field used in PlasmaDerm® therapy is based on a high-frequency alternated current. Contrary to direct current electrical fields, as often used in medicine, the alternated current electrical field has a sustainable deep stimulating effect on treated skin and wound areas. Deep stimulation increases blood-microcirculation in the skin, which in turn increases the supply of the wound with oxygen and nutrients. In short, PlasmaDerm® therapy activates the wound-healing power. PlasmaDerm® acts reliably antimicrobial and is effective even against multi-resistant problem germs such as Methicillin-resistant Staphylococcus aureus (MRSA). Primary indications for PlasmaDerm® therapy are chronic wound-healing disorders such as venous and arterial ulcers, pressure sores, and the diabetic foot syndrome. Deep stimulation with an electric field and the resulting stimulation of blood microcirculation lead to an improved supply of the wound tissue with oxygen and nutrients. Topically active plasma components reliably reduce the germ load in the wound bed. The combination of deep-acting stimulation of microcirculation and topical germ reduction activates the wound-healing power. PlasmaDerm® therapy can also be applied to wound healing disorders other than the above mentioned, e.g., poorly healing surgical wounds. By setting the des PlasmaDerm® device on the skin or wound surface, the affected area is exposed to “cold” plasma. Depending on the size and shape of the area to be treated, a different PlasmaDerm® device might be best suited to ensure equal and simultaneous plasma exposure. To achieve optimal results, PlasmaDerm® therapy should be repeated twice to three times weekly over a period of two to three weeks. On a case-to-case basis and depending on the indication, therapy can be extended. Application is simple and fast. Recommended treatment duration is 90 seconds of the area to be treated. After optimisation of technical settings, the PlasmaDerm® device can be used via one-button-technique. Following successful briefing, PlasmaDerm® Therapy can be applied by nursing staff. The easy-to-handle PlasmaDerm®FLEX9060 devices are suitable for use in mobile care. The devices are small, easy to transport and to operate. All you need is a 100-240 V socket. The sterile PlasmaDerm®FLEX9060 electrode covers an area of 27 cm². The PlasmaDerm®FLEX9060 electrode is flexible and can be adapted to the surface curvature of the skin area to be treated. The electrode is surrounded by a sponge, ensuring equal surface contact during plasma application. Only ambient air is used for plasma generation. No external gas supply is needed. 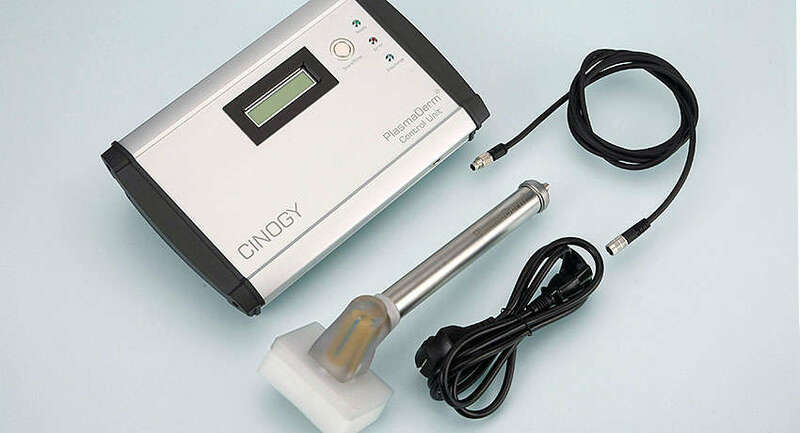 CINOGY GmbH declares the conformity of the devices with EU Guideline 93/42/EEC for medical devices. The PlasmaDerm®FLEX9060 device was developed for the treatment of large skin areas. The sterile, exchangeable PlasmaDerm®FLEX9060 electrode covers an area of 27 cm². The electrode is flexile and allows the optimal adjustment to the curvature of the skin surface. An extra sponge surrounding the electrode ensures equal spacing to the wound surface during treatment. Ease of use: Unpack the sterile PlasmaDerm®FLEX9060 electrode, fit it on the hand-held device, position the electrode on the skin area to be treated, and start the application by pressing one button. The PlasmaDerm® floor-standing unit is an optional additional piece of equipment/furniture to support the PlasmaDerm® medical devices. The floor-standing unit is fitted with wheels to easily move the PlasmaDerm® device from room to room. The unit is useful for in-patient PlasmaDerm® therapy in hospitals, nursing homes, medical practices or at a wound manager‘s practice. It. An integrated compartment provides space for sterile electrodes and spacers. For decentralised use, the PlasmaDerm® medical devices can easily be removed from the floor-standing unit.